Each spring, a nationwide high school art competition is sponsored by the members of the U.S. House of Representatives. The Artistic Discovery Contest is an opportunity to recognize and encourage the artistic talent in the nation, as well as in our congressional district. The Congressional Art Competition began in 1982 to provide an opportunity for members of Congress to encourage and recognize the artistic talents of their young constituents. Since then, over 650,000 high school students have been involved with the nationwide competition. 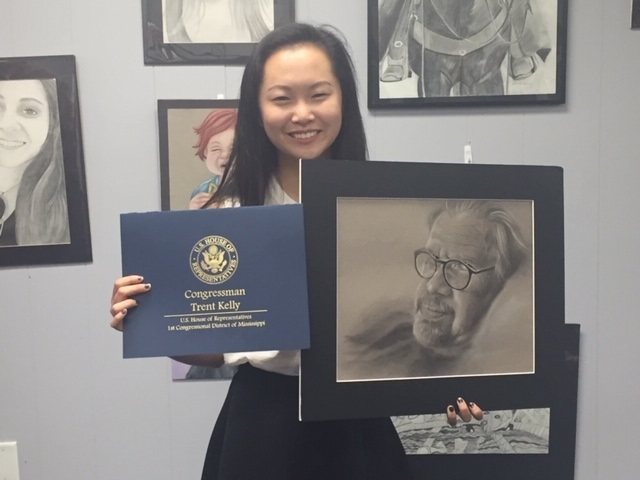 For more information about the 2019 Congressional Art Competition, please visit the official Congressional Art Competition page. Submissions will be on display at Farmington City Hall Boardroom. April 22: Award ceremony from 5:00 p.m. to 6:00 p.m. at the W.O. Benjamin Fine Arts Building on the Itawamba Community College Campus in Fulton. Artwork must be submitted to one of my district offices by April 11, 2019. Please call Melinda Whited in the Farmington District Office at (662) 687-1525 to set up an appointment to drop off artwork. Operating hours are Monday-Friday from 8:00 a.m. to 5:00 p.m. Please call Melinda Whited before delivering artwork to coordinate time and location. Last year's artwork from Mississippi's First District winner Helen Peng is among those included in the U.S. Capitol exhibit. If you would like more information on the annual Congressional Art Competition, please submit the following form.